SHOWTIME will now premiere the sophomore season of the critically-acclaimed psychological thriller PENNY DREADFUL on Sunday, May 3rd at 10 p.m. ET/PT. 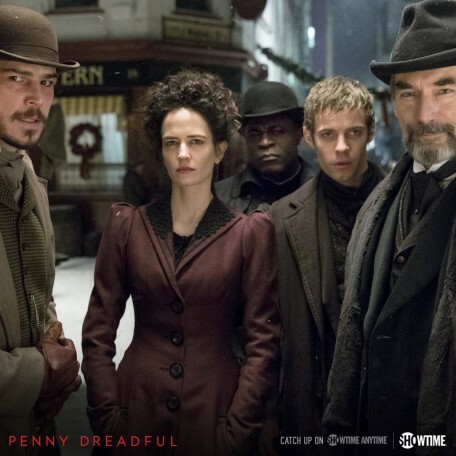 PENNY DREADFUL returns with ten episodes and will find Vanessa Ives (Eva Green) and Ethan Chandler (Josh Hartnett) forming a deeper bond as the group, including Sir Malcolm (Timothy Dalton), Dr. Frankenstein (Harry Treadaway), and Sembene (Danny Sapani), unite to banish the evil forces that threaten to destroy them. Meanwhile, Dorian Gray (Reeve Carney), the Creature (Rory Kinnear) and Brona (Billie Piper) are all waging battles of their own. Patti LuPone will guest star as a mysterious character of great importance in Vanessa’s past. Helen McCrory returns as Evelyn Poole (a.k.a. Madame Kali), the seductive spiritualist who will pose a unique threat to our protagonists this season, along with Simon Russell Beale, who is back as eccentric Egyptologist Ferdinand Lyle. Additional guest stars include Douglas Hodge as a Scotland Yard investigator; Sarah Greene as Poole’s powerful daughter, Hecate; and Jonny Beauchamp as a man with a singular past. PENNY DREADFUL is a drama series created, written and executive produced by three-time Oscar nominee John Logan (Hugo, The Aviator, Gladiator) and executive produced by Logan’s Desert Wolf Productions, along with Oscar winner Sam Mendes (American Beauty, Skyfall) and Pippa Harris (Revolutionary Road, Call The Midwife), both of Neal Street Productions. A co-production with Sky Atlantic, PENNY DREADFUL is currently in production in Dublin, Ireland. F‎or more information and video clips, please visit www.penny-dreadful.com. Also this spring, SHOWTIME will bid farewell to one of its signature series, NURSE JACKIE starring Emmy® winner Edie Falco, when the final season kicks off on Sunday, April 12th at 9 p.m. ET/PT. The network will debut new comedy series HAPPYISH starring Oscar® and Golden Globe® nominee Steve Coogan, Kathryn Hahn and Emmy Award winner and Golden Globe nominee Bradley Whitford on Sunday, April 26th at 9:30 p.m. ET/PT.